Archive staff will talk you through how to explore the wealth of riches in their collection and will have fascinating items on display for you to take a close-up look. On my walk we will pass from some of the worst slums in London to the centre of power and privilege, join Wordsworth on Westminster Bridge, see where the semaphore towers sending signals to Nelson’s fleet have been replaced by modern wireless aerials, view the Prince of Wales’ Bomb and locate the site of Astley’s Ampitheatre before returning past where Charles II’s ostriches lived, down Cockpit Steps in the wake of Hogarth and back to the Archives Centre. In the afternoon I’ll be giving an illustrated talk about how the Archives can help you dig deep into the past for your historical writing. 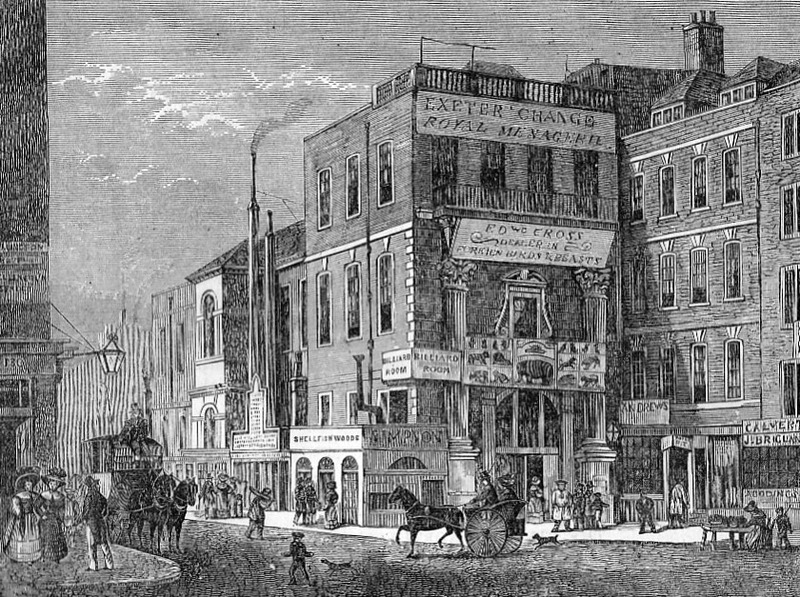 In Sense and Sensibility one of John Dashwood’s feeble excuses for not calling promptly on his half-sisters was that he had to take his young son Harry to see the wild beasts at Exeter Change on the Strand. 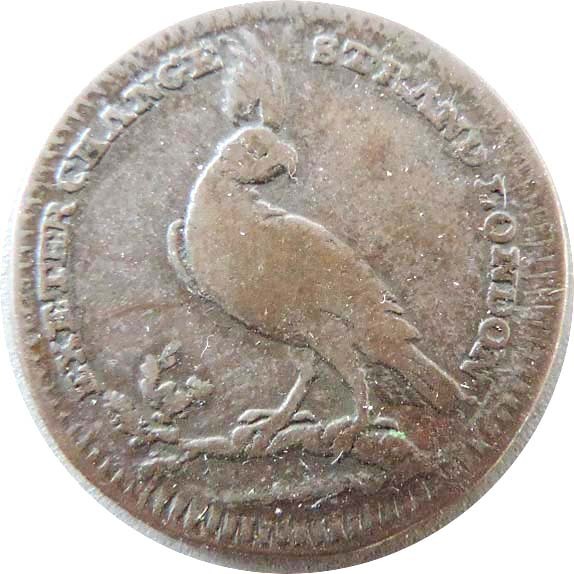 I was prompted to find out more when I bought a print from Ackermann’s Repository which shows the interior of “Polito’s Royal Menagerie” in 1812 and then found a copper token issued by one of the earlier owners, Mr Pidcock. 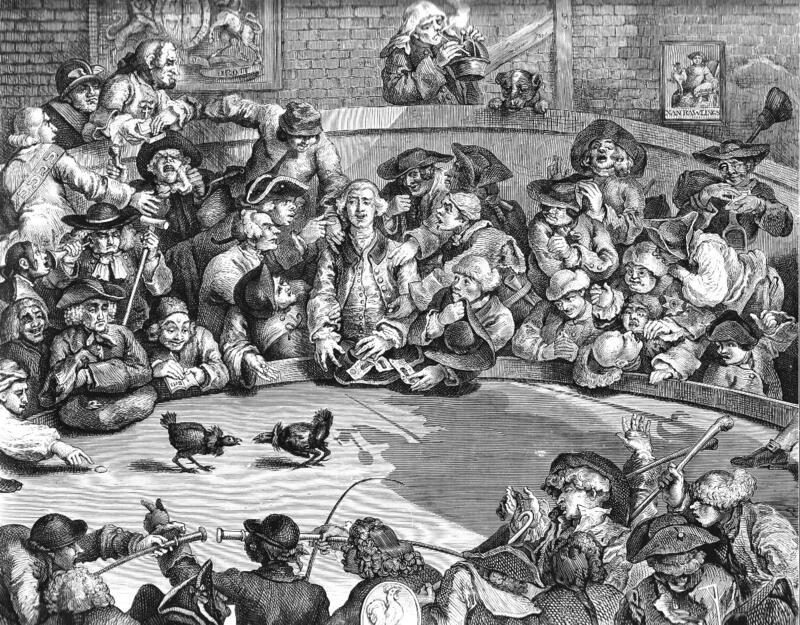 “The collection of divers beasts and birds [was] only exceeded in rarity by those of the Royal Menagerie in the Tower,” according to The Picture of London for 1807, but what neither the guide book nor the Ackermann’s article appear to find worthy of comment was that this little zoo was on the first floor of a building otherwise occupied by shops and offices. The collection included at various times adult elephants, two rhinoceroses, a pair of kangaroos, a “gigantic male ostrich”, a Bengal tig er and a pair of lions. How any of these were coaxed or carried up a flight of stairs is not explained. Exeter Change was built in around 1676 as a not very successful collection of small shops specialising in millinery, drapery and hosiery, but by the late 18th century many were let as offices. 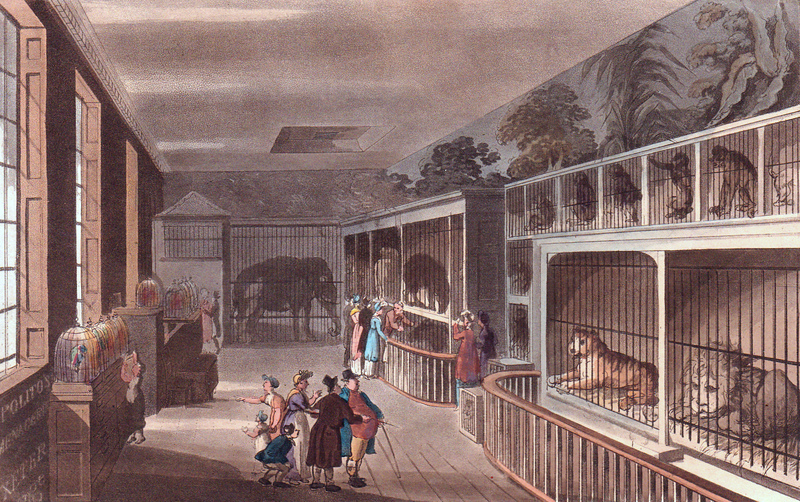 An animal dealer, Thomas Clark, began a menagerie on the first floor in 1770, advertising that the animals could be viewed “in complete safety.” In 1793 Gilbert Pidock, who had been using it as a winter headquarters for his travelling show, bought the menagerie and on his death in 1810 it was acquired by an Italian, Stephen Polito, and renamed The Royal Menagerie. 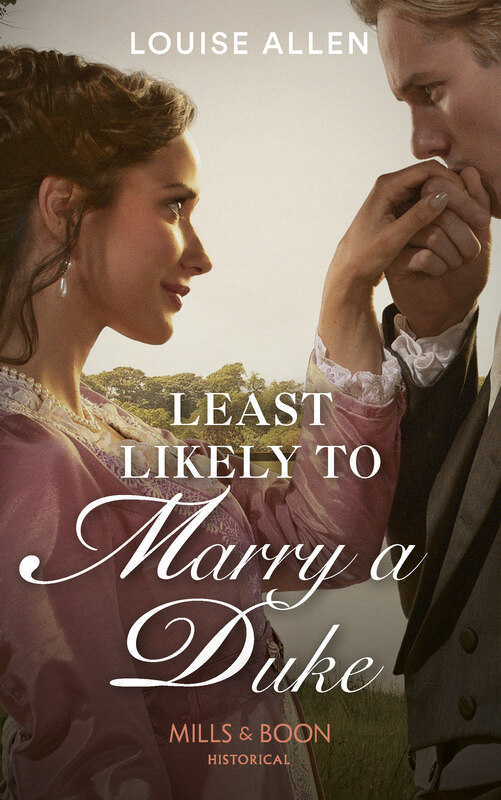 Edward Cross worked for Polito and his daughter married Polito’s brother. When Polito died in 1814 Cross took over the menagerie. 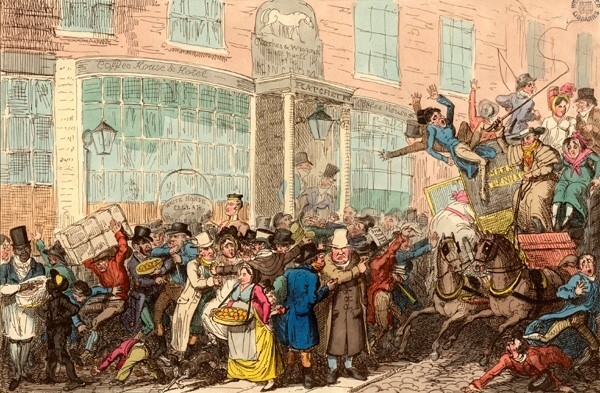 He tried on two occasions to sell the collection to the Zoological Society of London and moved it to the Royal Mews on the site of The National Gallery when Exeter Change was demolished in 1829. He eventually managed to sell some animals to the new London Zoo and moved the rest to the Surrey Zoological Gardens, which he created. Of course the conditions were utterly unsuited to keeping wild animals and complaints were made even in the early 19th century. In 1796 Pidcock had three elephants in one room. The most horrifying example of the cruelty was the fate of Chunee the elephant who weighted 5 tonnes and who became so irritable – understandably in view of a rotten and untreated tusk – that in 1826 it was decided he must be destroyed. When the first attempt to kill him by shooting failed, soldiers were brought from Somerset House further along the Strand. They also failed to destroy the poor creature, now maddened by pain and a cannon was ordered. Thankfully the keeper managed to kill Chunee before it arrived. The carcase was dissected by the Royal College of Surgeons. Numerous copper tokens were issued for the menagerie. 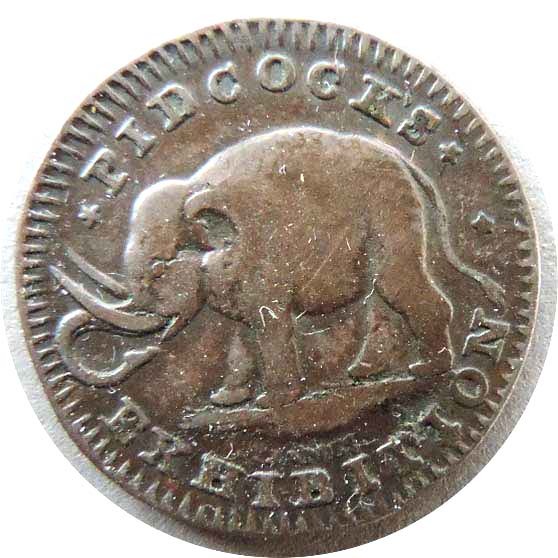 These were produced for many businesses in the late 18th century to supplement the poor supply of small coinage. The one I own shows an elephant with the words “Pidcock’s Exhibition” on one side and a bird and “Exeter Change, Strand London” on the other. Other designs showed lions, beavers and a rhino. Celebrity visitors included Lord Byron, who was amused by Chunee taking his money and then courteously returning it. He also saw a hippopotamus there which, he said, reminded him of Lord Liverpool. As the Ackermann’s print shows, this was very much a family entertainment. In my next post I’ll visit Bullock’s Museum where the public could view a wide range of exotic species, but, probably fortunately for the animals concerned, all stuffed.